It’s only with age and distance that you realise how much someone or something means to you. Adulthood and travel have shown me how much my place means to me – Belfast, Northern Ireland, Ulster and Ireland. The old homeplace, like habits, dies hard. The passing of the years and distance from home makes us hanker for the familiar – perhaps the soothing sounds of Van Morrison, the familiar words of Heaney and the reassuring sight of an Irish postcard. My diaspora friends from Sydney to Atlanta, Georgia cloak themselves in bric a brac from home. 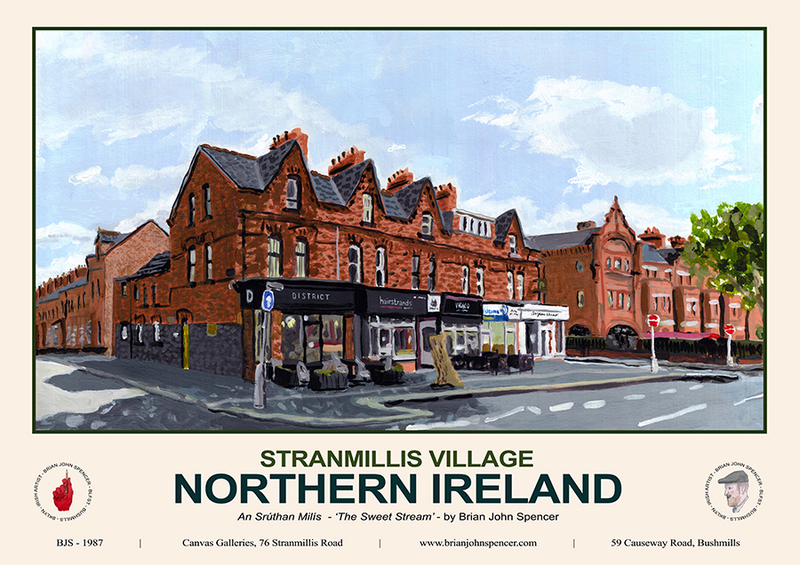 Stranmillis Village, as captured in the painting above, was a central part of my childhood and I collect art and writing about the area – it nourishes and warms my heart. 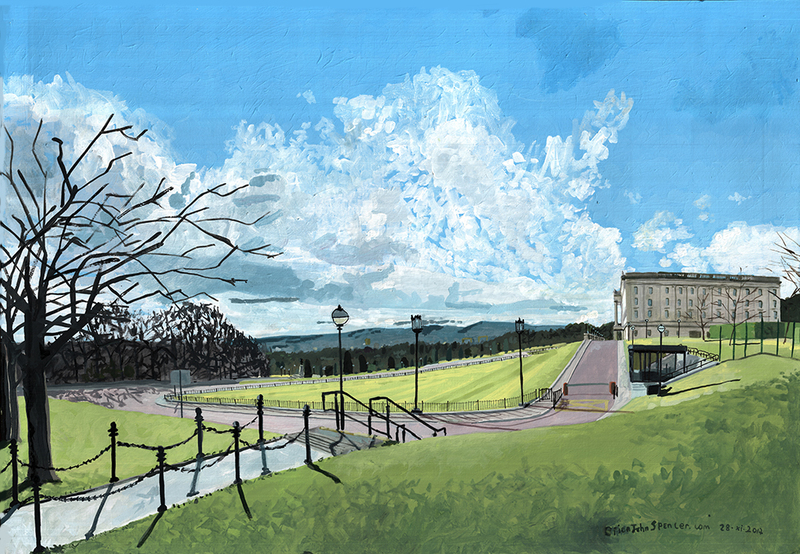 Seamus Heaney said that one function of poetry “is to write a place into existence.” The same applies to pictures and painting. Where would Italy be without the Mona Lisa and Leonardo da Vinci? Where would Britain be without ‘The Fighting Temeraire’ and Turner? Where would the US be without Norman Rockwell and his scenes of everyday American life? 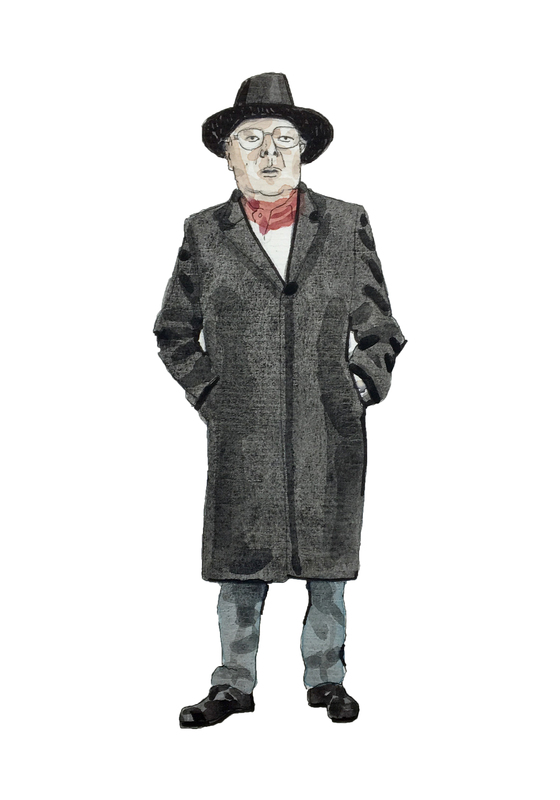 Artists, like poets, are unacknowledged legislators and makers of culture and place. 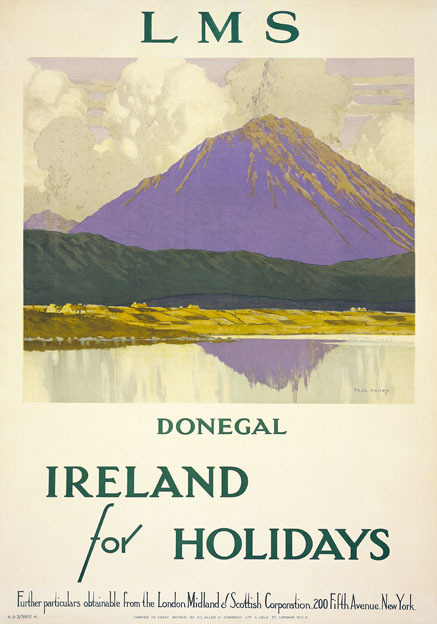 Where would we and Northern Ireland be without Paul Henry and his famous travel posters of the early and mid-20th Century? 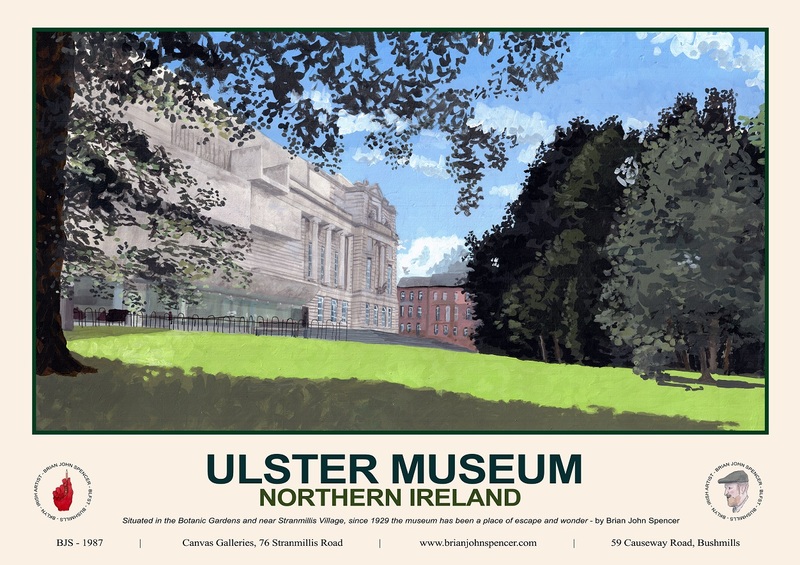 The painters of these posters, Belfast-born Paul Henry and Englishman Norman Wilkinson and others, painted Ulster and Northern Ireland into existence. The above poster was produced by Paul Henry in the 1920s for the London Midland and Scottish Railway Company 1920s. With his trademark clouds and rugged mountain peaks, Paul has captured Mount Errigal in Donegal. Small cottages sit at the foot of the mountain. These posters helped to establish the standard scenic view of Ireland in tourist literature and in government publications. People may not know Henry and Wilkinson but they have seen their work. Once their posters brightened railway stations, now they light up the walls of our homes and many of the hotels and public houses of Northern Ireland. These images are part of our visual vernacular and shared memory. 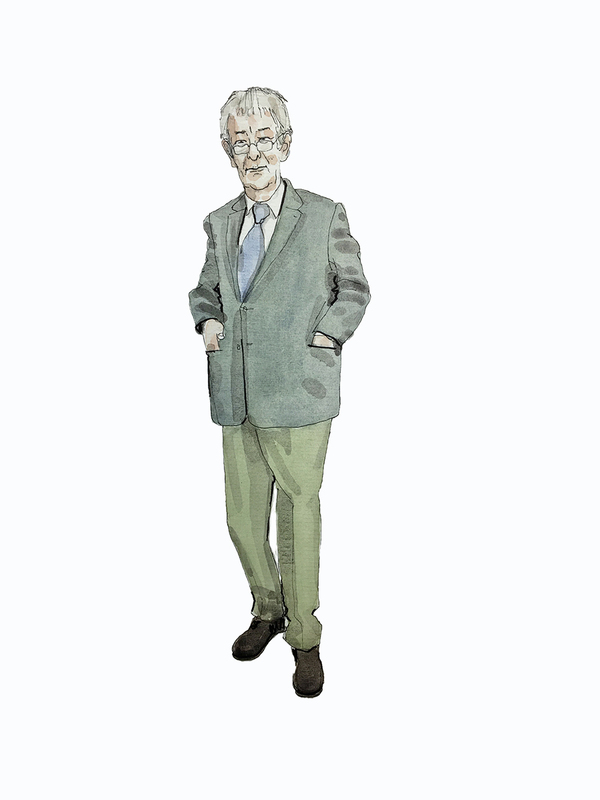 Northern and southern Ireland only came into existence in the 1921, wracked by the after effects of war and uncertainty it was Paul Henry and other artists and writers who helped the people find their feet. To me the bright block colours of a Henry poster are every bit as stirring as the sound of bagpipes. I’m astounded by his sublime artistry. 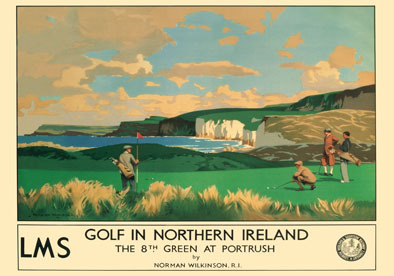 It captures Portrush and Bangor exactly as I remember them, including the veneer of nostalgia – The grass is greener on the good old days and in a Henry and Wilkinson poster. The above painting is a sublime and timeless rendering of the north coast by Norman Wilkinson. Exile made me want to capture and show off the special people and beautiful places of Ireland with an immense urgency. Like the vintage travel posters, the grass of Ireland in America was brighter. The mood at home is all too often grey and bitter, but that’s not the full picture. Northern Ireland is more than peace walls and black taxi tours and the Troubles. I want to show off Northern Ireland in its best light. Inspired by the Paul Henry and Wilkinson vintage travel posters I have captured some of the landmarks and landscapes of Ulster that strike and mean the most to me. These images are home to me and to others – Home really is where the art is. This chapter of Northern Irish is rather downbeat, but I can only hope these pieces remind people of the exceptionalism of our ramshackle but charming and beautiful homeplace. This is my attempt at painting a brighter Ulster and Northern Ireland into existence. November 30, 2017 in News & Current Affairs. The Art of ‘Ulster’ ? Perhaps. 50% still find NI to be an alien place. Its strange to be an alien in a place where your name indicates your family have been here 100s years before the Plantation. The other 50% do not even begin to understand this.